Last Sunday, Mom and I drove up by Hamilton to pick up two little 9 week old Rex does. These will be the mothers of my meat rabbits. I chose the Rex as my choice rather than going with New Zealand Whites because as a two-person family, we really don’t need a super high production animal, and with the Rex breed, I can learn to tan hides as well, and have some really lovely furs. This is good, because I believe it’s important to waste as little as possible when a death is involved. Blackberry is a “black otter”, a color I didn’t know ever existed until I started looking at Rexes. I’m really pleased to have found her, because I fell completely in love with the color. Thistle is a blue, and is so lovely and plush! Unless you’ve petted a Rex, you have no idea of how incredible this fur feels. It’s completely unlike regular rabbit fur. They are living together as a colony in the Bunny Barn I built them. It has a thick layer of pea gravel, followed by hardware cloth to keep them digging out (and other critters digging in). The inside is spacious, enough room for a hay loft. The roof is a framework of wood, covered in more hardware cloth, with a used billboard tarp to make it waterproof. These tarps are pretty cool, being tremendously cheap as well are being fairly indestructible. You can’t choose what design is printed on it…mine is an advert for an island golf resort! They have a litter box (which they are already using) because I want to collect their manure for the garden, and a hayrack made from an old magazine rack. There is a side door; it will lead eventually into the buck’s quarters. Only the foundation of this section is built so far. The chickens are enjoying peering in through this door to be scandalized by the new neighbors! There are big windows in the front, both so I can walk by and see inside, and so the bunnies will be able to jump up on a window ledge and see out themselves. They will have a great view of the chicken yard! Then, yesterday, we met another breeder in Stanwood and picked up our buck. He’s a bit older, about 6 months, and is a real sweetie. I think his name is going to be Sorrel (we name all our rabbits after garden plants.) Until his Bunny Barn wing is completed, he’s got a pretty fab apartment in the Roof Garden quail coop. I moved the white Bobwhite girls out to another coop, cleaned it out, and moved him in. I put in a litter box for him, too. And if you’re wondering why their food is in/close to their litter box, it’s because rabbits like to poop and eat at the same time. His hay rack is made from the wire bottom of a hanging flower basket. He likes his ‘nest box’. And even though he has all this room, and doesn’t really know us yet, he still is friendly enough to come over and say hello. It’ll be quite awhile before the does are ready to breed, but until then, I’m enjoying these little sweeties! 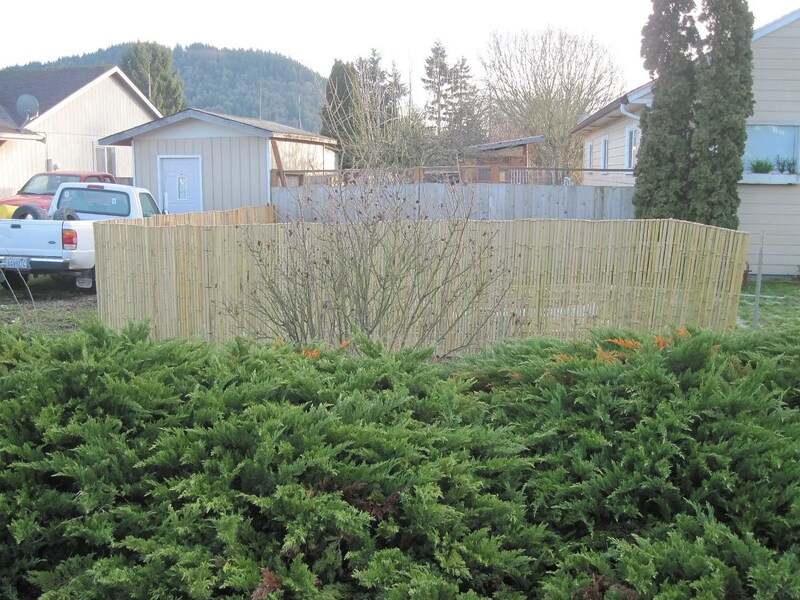 First of all, though, let me show you a couple of pictures of the progress on our front yard garden fence. We basically have two sides done, which means we only have one side left to go. And it’s killing me that the weather turned wet and windy, so I can’t work on it. 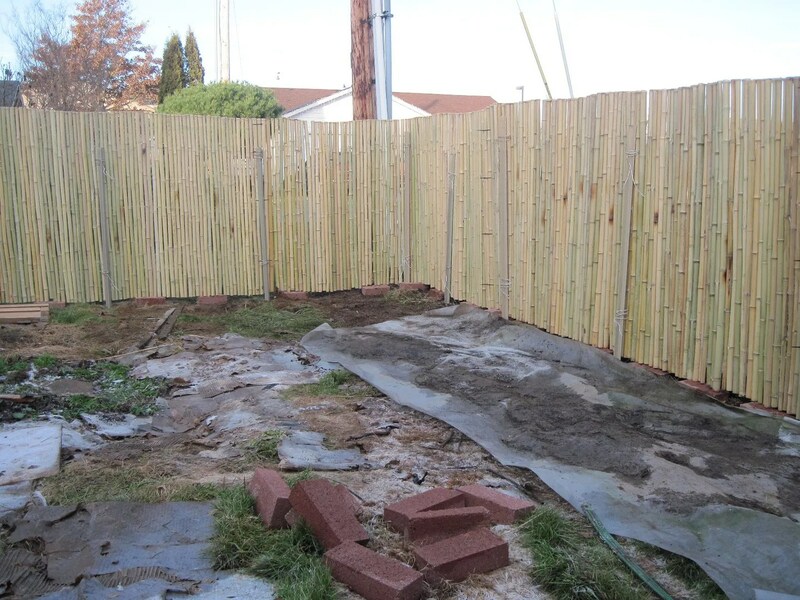 In case you missed the previous post, it’s made of rolled, 1″ bamboo fencing, attached to T-posts. While I can’t work outside (I refuse to make myself miserable by working in the rain) I’ve been doing some more research into apple trees. I was originally planning to have purchased them last fall, for planting this Spring. That did not happen…because wow. Getting apple trees is FAR more complicated than I would have imagined. First of all, there are a million different varieties, and they all require different pollinators, so you can’t just pick one and bring it home. You have to make sure that you have one or two others that will bloom at the same time. And even then, you have to make sure that they are varieties that actually have fertile pollen! I didn’t know that. I knew fruit trees often require a second tree to pollinate, but I had no idea some apple trees have infertile pollen, and are completely incapable of pollinating anything. If you get two of those trees, you won’t get any fruit at all. 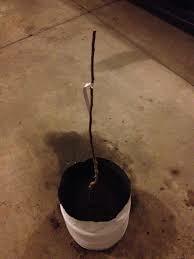 Then, you have to select a rootstock to have your tree grafted onto. There are a many choices, and they all have their pros and cons. I’m looking for something that will make a dwarf tree, because I plan to turn mine into espaliers. So at this moment, I am still trying to figure all this out, but I am utterly determined to order my trees this fall. For one thing, since I am doing espaliers, I have to start out with a 1 year old tree. Basically, a stick, with no branches. But as you can see, it’s not going to be ready to produce fruit for some time. I need to get started ASAP! So freaking beautiful! And a great keeper, too. It starts out quite tart on the tree, then sweetens in storage. And they are, quite possibly, the most beautiful apple ever. 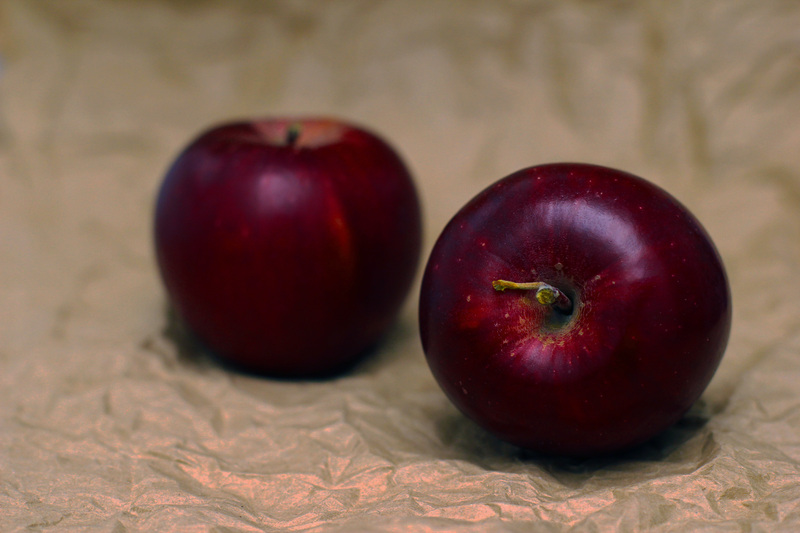 It is also a heirloom apple; it has been around since 1870. 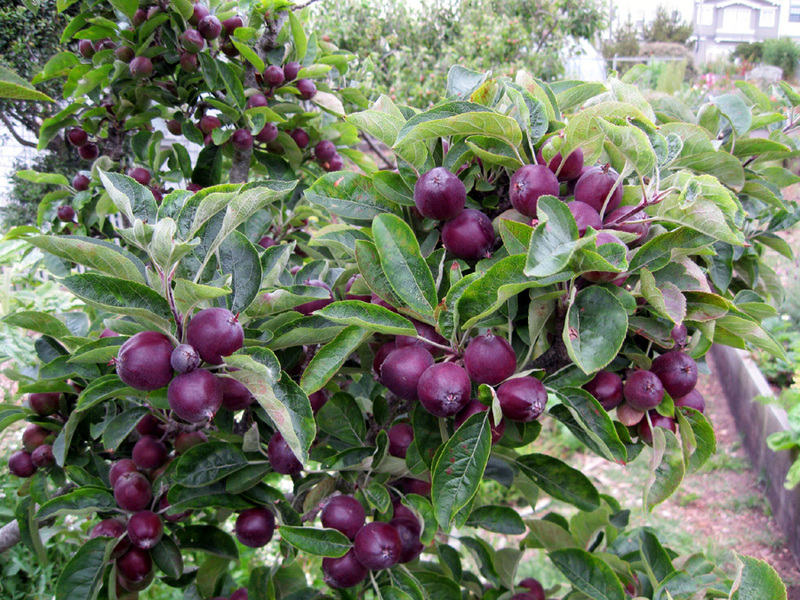 Another is Cox’s Orange Pippin. This one is even older, dating from 1830, and it reputedly the BEST tasting apple in the world, ever. If it likes you. It’s also reputedly somewhat difficult, which would normally make me give it a pass. But I am just hugely drawn to this apple, so I am going to give it a try. 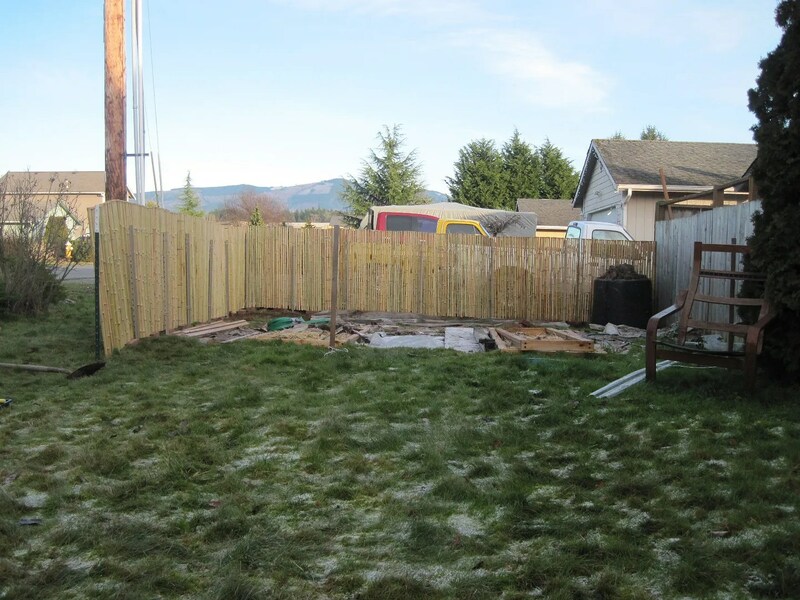 It grows well in England, and the Pacific NW is often described as having an English climate. Gravenstein is my third choice, and also very old, dating from around 1669! The problem with both Gravenstein and Arkansas Black is that they both possess infertile pollen. 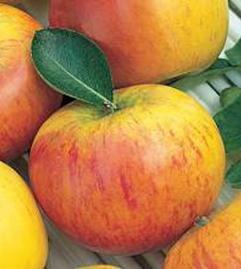 Cox’s Orange Pippin is a pollinator, but is not enough. I need at least one more fertile apple tree. I may end up getting a crab apple. 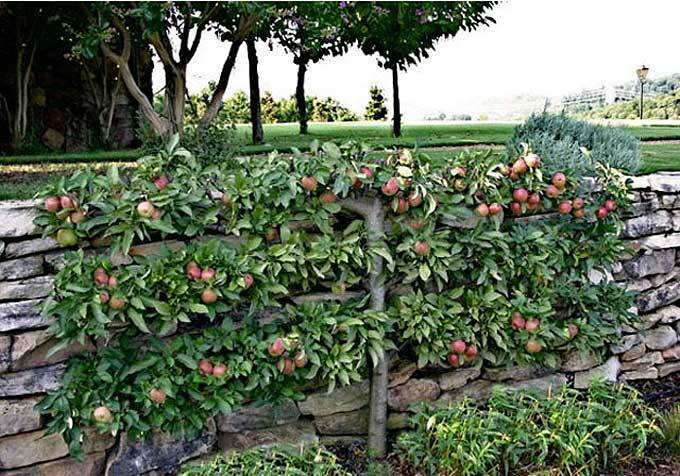 They are among the best pollinators for other apple trees. One crab I wouldn’t mind having is Wickson’s Crab. It is far sweeter than most. I am also mulling over the whole meat rabbit thing. I already know that I don’t want to keep them in small cages – and absolutely NO wire on the bottoms. I want to give them a happy, natural life. Recently, I’ve begun looking into keeping them in a colony setup. I’ve been really impressed with what I’ve read/watched so far. I’m also considering French Angoras as my breed of choice. 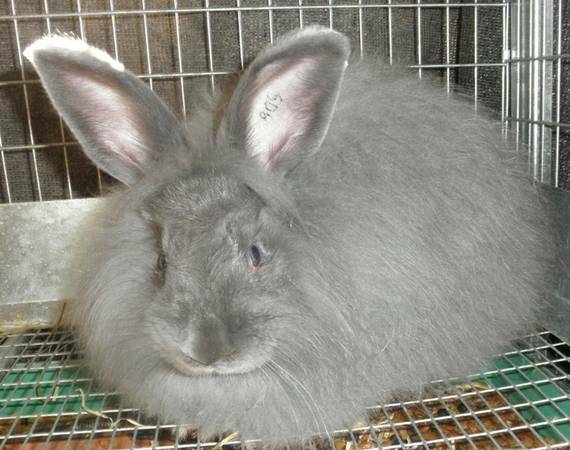 Yes, under all that fluff, they do have the body of a meat rabbit. In fact, they were originally bred as a dual purpose animal…meat and wool. If I keep angoras, not only will I have a source of meat, but I could sell babies and wool for a little extra income. I’ve also long been interested in learning how to hand spin with a drop spindle, so maybe I’ll end up keeping all the wool for myself. Another bonus; angoras are so soft. In fact, when you pet them, you can hardly even feel their fur, it is so incredibly soft. They are also quite easy to keep, not nearly so demanding as other angora breeds, and are very gentle.